Kijiji's latest TV ad is getting some attention -- some if it for the wrong reasons. "A new TV ad from Cloudraker/LoveCat Studio shows settings intended to represent a typical basement, cottage, or spare room filled with stereotypical Canadian products," writes Hollie Shaw in a Marketing column on the Financial Post website. "It encourages people to revisit the roots of the site, buy and sell, and is running in English and French markets. More than half of all the live ads on the site (about 2.8 million) are posted within the buy and sell category." The ad itself is harmless, and in fact is funny. I rather like it, and I hope it's effective. A mustachioed lamp is talking to a worrisome barbeque about the home's owner listing things for sale on Kijiji. 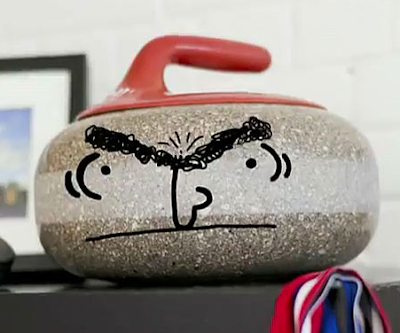 One of them says he hopes the grumpy "curling stone" is sold, because he hates that guy. Here's the stone in question. This curling rock looks just like Tie Domi. The question is: Shouldn't it be a curling ROCK, not a STONE? The ad struck me as odd the first time I saw it. Not because the rock looks exactly like monobrowed former Leafs enforcer Tie Domi, but because hearing it called a "curling stone" grated on my Canadian nerves like someone in an ad saying "loo" where Canadians would say "washroom." Eager to find out whether I'm being a petty, pedantic, picky, pointless jerk (which is admittedly a likely scenario) or whether I'm in the right, I first checked Wikipedia. "The curling stone (also sometimes rock, North America), as defined by the World Curling Federation...."
Okay, Wikipedia's prime definition is for "stone", with "rock" being a North American variant. I surveyed the office. Men over 50 said stone, but everyone else said "rock" first. Then I started phoning curling clubs. The first said "rock". The second said "stone". The third said "rock". The Canadian Curling Association said via @CCACurling on Twitter: "Stone is the official word, but you could call them rocks, boulders, bricks or anything else... so long as you're throwing them!" So, am I wrong? No. Is Kijiji's ad agency wrong? No. Stone is right. Rock is right. But, Kijiji's ad agency could have targeted its message even more strongly to Canadians by using a North American variant -- rock -- instead of the global standard -- stone. I will stop throwing things at my TV now, and fall back to just grumbling in the corner like an underused curling rock. And if you still love the Kijiji Curling Stone Rock, go "Like" it on Facebook.